The picture on the left is taken from a story we printed in the East London Advertiser in 2008. 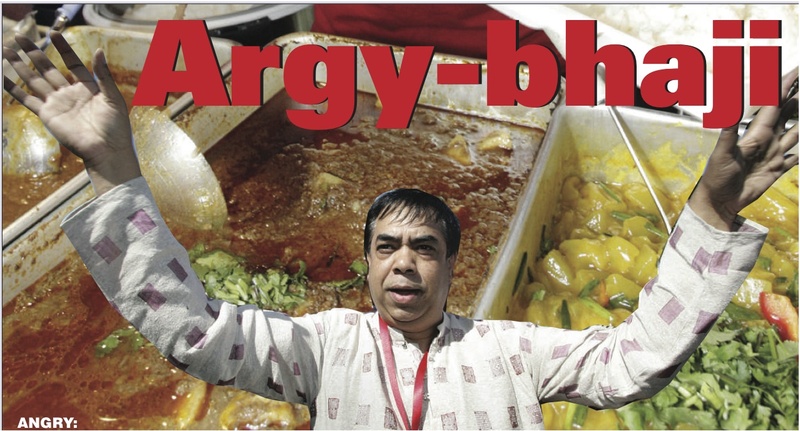 It is of Shiraj Haque, King of the Brick Lane curry kings. Anyone with more than a passing involvement in Tower Hamlets politics would have come across him. He boasts about his influence with politicians – and for good reason. As owner of the Clifton Group, he owns the Clifton curry houses in Brick Lane and on the Isle of Dogs, where he also runs a supermarket. He also owns property and investment companies (more on that later). At the age of 53, he is said to be a millionaire and the most powerful man in Brick Lane. He also says he’s a Labour supporter, but he’s also in the past said to have offered funds to the Tories, Respect and even the Lib Dems. He’s a man for all seasons is our Shiraj. But he’s certainly no saint. That is, both the council and independent auditors were aghast at the lack of financial control in the Trust. The council then invited other groups to run the event. To Shiraj, that was an act of war. Ever since, it has been his aim to regain control over his beloved Mela. Was this one of the reasons why he backed Lutfur Rahman’s bid to become the first directly elected mayor of Tower Hamlets? Time will tell. What is certain is that he’s pulling out all the stops for Lutfur. And here he is, even inviting members of the Tower Hamlets Tory party to a massive fundraising/campaign event at the Troxy on Tuesday. The popularity of the property market has not escaped the grasp of Clifton Properties. Established before the millennium, Clifton Properties experts understand the ins and outs of a dreadfully complicated and daunting property market. How fortunate Labour and Lutfur are to have such support. Incidentally, I can’t trace any donations made by Shiraj to the Labour Party on the registers kept by the Electoral Commission. If anyone knows under which names those donations were made, do please let me know. Rubbish. He inherited an established mela and controlled it like a directly elected mayor. He recruited idiots to the mela committee simply to make it seem like a democratically elected body but they never had a say upon anything. The only mistake he made was allowing ex-councillor Doros Ullah into his board who subsequently challenged his dictatorship and resigned, no longer the good close friends they once were. Even that other councillor guy Shahid Ali is more popular in Bengali community as concert organiser. If Lutfur becomes mayor, he should utilise him but maybe Shiraj won’t let him because he will be worried to loose control and he knows Shahid can do better job like he did biggest show at Royal Palace Tower Bridge. Calling lutfur and his minions ‘Islamic fundamentalists’ indicates something of a desperation: the right of th labour party call him such to spread fear and create an ideological difference.